"As we headed north, there were two bridges to our right. American bombs destroyed the first Hien Luong Bridge in 1967 and again destroyed it in 1970. At the time, it was painted half red and half yellow as a symbol of the ideological and physical division between North and South Vietnam. In 1973, an iron girder bridge was built and reopened following reunification in 1975. The current bridge was built in 1999." The Hien Luong Bridge - is a bridge across the Ben Hai river, which was part of the border between North and South Vietnam from 1954 until the reunification in 1976. 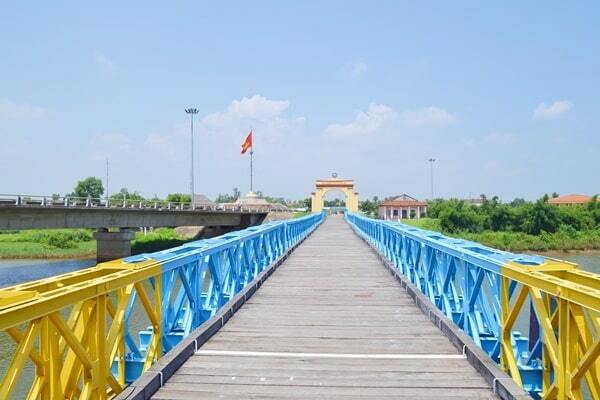 Today, the bridge is still there and seen as an important national monument to the reunification of Vietnam. Near the bridge is also a museum, propaganda war remnants and two memorials. The old narrow bridge itself is a simple steel structure built by the French. The bridge is now just a pedestrian bridge. A modern bridge, which is next, takes all the traffic across the river on its behalf. You can walk across the old bridge over the entire length (165 meters). The old bridge was during the war with the Americans, part of the DMZ. The acronym DMZ stands for Demilitarized zone (literally a demilitarized area). It is a buffer zone between two countries where tensions exist. In this case, it was the North and South Vietnam. More spectacular than the bridge itself is huge Reunification Memorial on the southern side. It's actually a rather elegant structure. It consists of six upright feathers with in the middle a woman and a child. On the north side there is a monument: a huge flagpole, which stands on a pedestal. It is decorated with an elaborate and biggest socialist realism mosaic. In this mosaic are illustrated scenes of war, life in the tunnels (for example, Vinh Moc), planning and negotiation meetings, etc., etc., but the most striking: victory celebrations. The level of this kitsch is very interesting. Next to the bridge there are high stacks of speakers on steel racks. Apparently these were used during the years of the war to blow noisy propaganda to the other bank of the river. It was a form of psychological warfare, which is still used in the DMZ between North and South Korea. These days they are, fortunately, still. In stilt houses near the speakers scenes are "acted out" of the negotiations by a rather rude made dummies. The museum is much better, though. However, there continues the glorification of war. If you walk under the wide gate of the museum, you are greeted by a large golden statue of Ho Chi Minh. Behind the statue is even more gold. Among the exhibits are pictures from the period of the war and also a painting with the colors of the famous bridge. The northern half was (obviously) painted red, the southern one blue (although other sources claim that the southern half was actually yellow). The highlight is a life-size diorama, which shows the capture of an American pilot. The bronze figure of the "Yankee" is on his knees with his hands up, while two guns aimed at him. The painted background shows a rural scene with farmers and water buffaloes. On the other hand you see fire fight with an US aircraft, which falls from the sky. While "under" daily life in the tunnels (Vinh Moc) is shown. It is a rather romanticized fashion of the war. 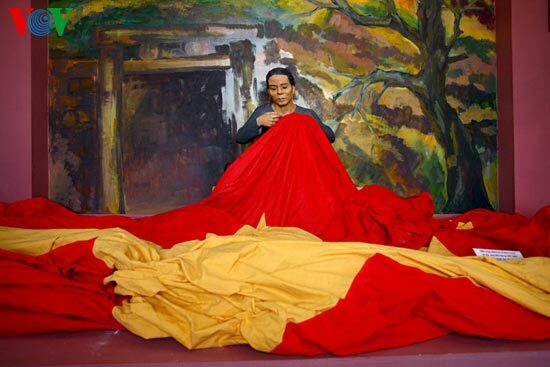 Another type of heroism worship is depicted by the wax figure of a woman, who is sewing a giant flag (the national red one with the yellow star in the middle). Location: just over 35 km north of Dong Ha (between Hué and Dong Hoi) in central Vietnam. Hien Long Bridge Located off Highway 1 and is therefore easy to find. The visit is also part of a tour, you can book in Dong Hoi or Hue.